This medicinal mushroom supplement provides powerful blood-borne immune support for your dog by activating a certain class of white blood cells. Dramatically increases Natural Killer cell activity for superior immune defenses. Harness the Power of Medicinal Mushrooms to Dramatically Enhance Your Pet’s Immune Defenses! From American BioSciences, member of the strict regulatory agency NASC (National Animal Supplement Council)! Medicinal mushrooms provide an active type of immune support like no other. 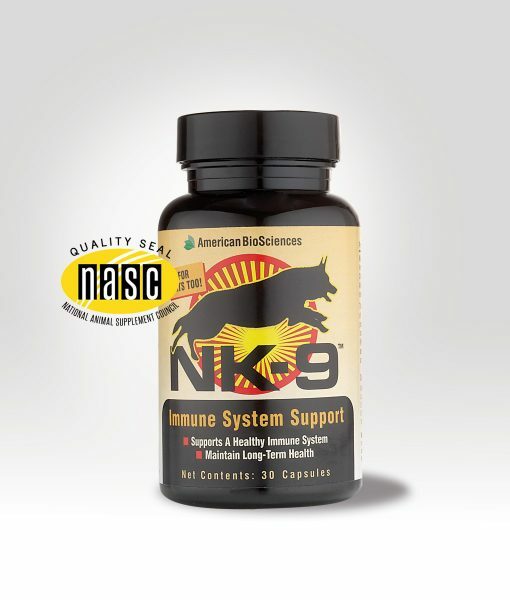 NK9 doesn’t just provide support; it also enhances a critical defense mechanism. It works by activating a class of white blood cells in your dog’s immune system called Natural Killer (NK) cells that protect the immune system from harmful invaders. Natural Killer cells are the front line defenders of the immune system. Born to kill, they are constantly on patrol, looking for pathogens that would like to damage your’s dogs health. The battle causes NK-cell function, power, and activity to fluctuate, especially in times of illness or stress. As its NK-cell function wears down and response declines, the dog’s entire immune system becomes exhausted and overwhelmed. NK9 quickly turns all that around. Its active ingredient AHCC (a highly potent substance derived from a new, extremely powerful, hybrid mushroom with superior immune-enhancing properties) stimulates these vital cells into a more wakeful state and increases their activity substantially. It also supports peak activity of other key immune white blood cells, like T-cells, B-cells, and macrophages to provide better immune support as well as acting as a strong adaptogen and immunomodulator to help balance a chaotic immune system. And NK9 gets to work quickly, with strong increases in Natural Killer cell activity within days. Veterinarians at Nihon University, Japan’s largest university, discovered why NK–9 works so well. Their study results showed that Natural Killer cell activity almost tripled in dogs taking NK9. Even more impressively, it only took seven days! NK-9 also nearly tripled the activity of large immune system fighters called macrophages. When intruders get into your dog’s tissues, the macrophages are there waiting to literally eat the invaders and render them harmless to your pet. NK-cells are born to kill – which is why your dog needs them so badly right now. They inject the invaders with “hand grenades” of cytotoxic granules that cause the invading cell to “explode” in seconds. Killers cells in a compromised immune system are under attack and reach an almost dormant state. Use NK9 to boost their activity and your dog’s immune health. Each capsule contains 250 mg of pet-formulated AHCC proprietary blend. Contents of capsule may be mixed with food for easier administration.